A recent survey reveals that all high school students knowingly or unknowingly take up at least one vocational course during their studies. But this was not the story in the initial days – where it was just meant for those with learning challenges and they were in the first cadre of “to be drop outs”. Few years back online vocational courses and certificate programs were a dream - licensed private career schools did not exist and accredited career schools or technical colleges were not established by government leading no where to find best schools specializing in vocational educational training. Nowadays basic academic subjects form an integral part of vocational training – teaching them additional work skills. Students who opted for vocational courses in the high school are of the same population as compared to students who attained their high school in traditional classes and syllabus. Schoolanduniverstiy.com would like to give you a walk through this so very essential and increasingly popular vocational training. What are the benefits of Vocational Training and trade schools? This is the training – education to hone skills of students to help them succeed in specific areas of work to lead a successful life. Conventional or modern, usually all education includes vocational training – the severity might differ. Computer skills – automotive repairs and cosmetology are good examples to it. These are the skills; for any specific skill set are the ones which are directly co related to the central operations – working of any business or company. Automotive garage might need hard skills in form of changing oil - fixing transmissions - air conditioning systems - repairing electrical panels and changing tires as well. Apprenticeship or OJT (on job training) are ways to learn these skills. It is one of the easy to learn and quantifiable skill set as they are not concepts or academic theory dependent. Soft skills are all about people management and interpersonal skills. It includes relationships - dealing with internal and external customers; co workers and public. All who attain these skills are the ones who can think on their feet – quickly resolve issues – good leader and can handle teamwork – good critic – can motivate others – role model for others. These skills are neither quantifiable nor all of them can be taught; instead one can gain them through experience only. Irrespective of vocational – they are very important for any job or career one wants to succeed in. These are skills that focus on specifics – the skills one possess. Any organization or careers in computers if are looking for technical skills – it will includes use of computer applications - how to program computers - how to use special software – networking - how to resolve server issues and how to fix broken computers as well. People with technical skills are supposed to highlight their skills prominently on their resume. This is one of the most important aspects of vocational training. It is so because here it is where vocational education for students with disabilities is imparted to be independent and earning on their own. Trade school or career school occupation skills will help individuals to gain and develop their skills required for employment to fulfill whatever is required by the employer at the work place. Good work habits – work responsibilities and much more. Soft skills is also a part if such training programs helping them to interact and communicate with others inside and outside the organization. Other skills taught to make them independent include - how to cook - pay bills and manage a household budget. What are the Benefits of Vocational Training? If we take a sincere look at the American education system; we find that they focus more or rather they are purely focused on subjects like English – Math and Social studies which prepare students for attending colleges and universities in the coming year. However; vocational studies solely focus on learning skills for a specific occupation – employment aspect. Realistic approach or practical skills which come handy to students immediately upon employment is one of the biggest advantages of vocational training. Such trainings are crafted in a manner to teach the participants/students the skills to fulfill the tasks that are expected out of them upon employment in fields such as auto maintenance – carpentry – medical assistance and many more. Traditionally educated students might face challenges putting their learning/education to work whereas vocationally trained students are likely to find a fitment promptly. The second advantage to vocational training is the time frame required to get employed in completion of education. Vocational trainings take less time to prepare students to enter the work force as compared to traditional education. Several high schools have emerged imparting vocational training to students enabling them to attain practical skills by the time they reach adulthood. Programs ranging from two years or less are comparatively more appealing than traditional education. Entering work force at early age means early income and more tenure as a working individual enhancing one’s savings and standard of living. We all know about the much accepted fact; that academic education proves to be costlier as compared to paying for vocational school or vocational education. Best online colleges offering vocational programs degrees helps people incur less debt – leaving you with more freedom to enjoy your income. A four year degree program might need you to incur a debt of $100,000 where yearly expense would be anywhere from $ 30,000 to $ 40,000. Vocational trainings provide students to learn more effective and promptly usable skills at a much lower cost. These vocational career programs from top online schools for vocational training or online trade schools also have an added advantage to students; of putting their skills at work in the summer employment to earn some money to pay for their traditional college degree if they want/need to pursue one. All individual students have their own pattern of learning. Slow learners – fast learners – readers – writers – crammers – hands on trainings – experimentation – discussions – trial and error and so on. Students who are termed as non performers at academic education classes might come out with flying colors at vocational trainings as they are good at hands on activities and experimentations. For all those who are still wondering about “is vocational school good?” We would just say that the future of vocational training is very bright. 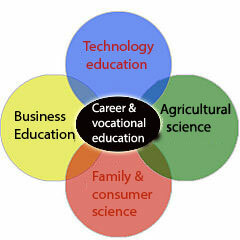 Today you may find vocational technical education programs at a lot of community colleges and see online career training programs - accredited online vocational schools - online vocational nursing schools - online schools for medical careers - online career training - online career test - online trade schools and many more, which is a clear indication that things are moving in the right direction.